I’ve been on the hunt for a natural shampoo and conditioner product for some time. I tried the no poo (no traditional/commerical shampoo) method last year. It doesn’t work for me. Whether it’s the hardness of our water in the South (it’s BAD here) or whether I’ve got the wrong balance of baking soda to vinegar, I don’t know. And after quite a few months of trying, I didn’t care anymore. LOL I just want something free from chemicals, parabens, sulfates, etc. There are LOTS of organic and natural products out there. So I started looking around and keeping my eyes out for what others use. When I finally threw in the towel on no poo, I starting using Renpure Originals, specifically the Brazilian Keratin Straightening shampoo and conditioner. Renpure products are made in the US, tested on the family who invented them, and are relatively free of harsh chemicals. BUT they aren’t quite as organic as I’d like, according to Skin Deep, a website database that rates the chemical content of beauty products. Don’t get me wrong, Renpure has been a good product and I do believe it’s a step up from bottom shelf commercial products. I just knew I wanted something more organic and natural (and accessible) so I kept looking around. A popular blogger (CaveGirlEats/Liz Wolfe) who happens to be the first person I learned about no poo from and who turned me on to many life-changing ideas mentioned JustNatural Organic Care products not long ago. Even though I can’t FIND the stupid post to refer to it. Maybe I’m losing my mind. Maybe she mentioned it on facebook. Idk. Regardless, someone I follow mentioned using Thicker Hair Shampoo by JustNaturals when traveling because it’s not easy to do no poo on the road. 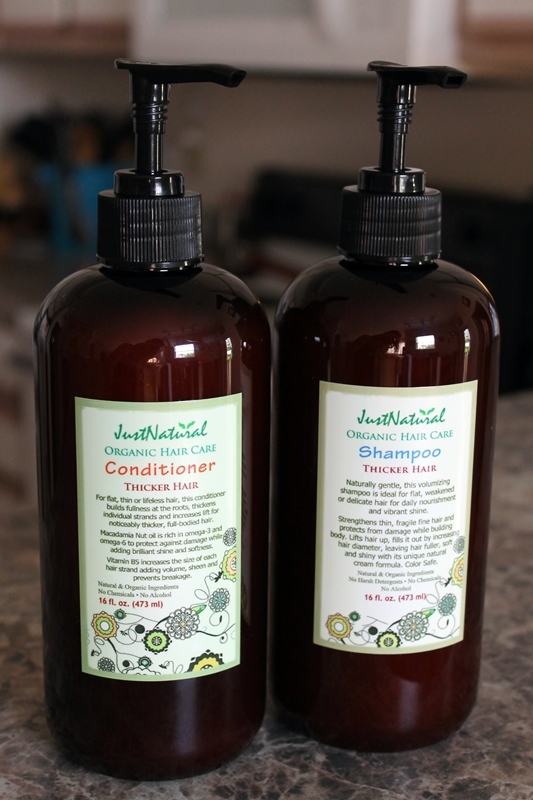 After much reading about JustNatural products, I decided that I wanted to give them a try. I received my new shampoo and conditioner last week. I only wash my hair every 2-4 days, depending on activity level, so I’ve only used them twice now. But I am pleased with the results. My hair is soft and manageable. They smell pleasant, kind of like honey. And the shampoo, to my surprise, really lathers up well with very little product. You do have to remember to shake the bottle first. There was a note in the box explaining that the natural ingredients often settle and that you will get the best results if you shake the bottle before using each time. You can see the full list of ingredients here if interested. What do you use? I’d love to hear about your experience too. After exposure to toxins some months ago, I developed many chemical sensitivities. It’s been in the back of my mind to find better beauty products for a while, but I’ve been postponing because I knew it would be difficult. Glad to have some pointers here . . . I hope it is helpful. I have another post that will be going up soon that will have a lot of links for other natural and chemical-free products too.